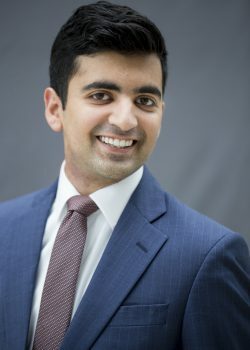 Vishal Khetpal is a third-year medical student attending the Warren Alpert Medical School of Brown University with interests in health policy and communication. He earned a master’s degree in global health from the London School of Economics in 2015, and frequently contributes essays for public audiences on topics related to politics and health. “A career in medicine was something of an inevitability for me. I grew up in Durant, Oklahoma—a town of about 15,000 people, a pit stop on US Highway 69/75 connecting Tulsa to Dallas—where both of my parents still are physicians (my mother is an internist and my father is an interventional cardiologist). In a town that size, communities were and continue to be close-knit, and throughout my childhood, I saw firsthand just how powerful the connections between physicians and their patients can become. I was introduced to my current understanding of professionalism in medicine and the ways in which it shapes the trust between patients and physicians by the cards of gratitude, jars of marmalade and hugs at the local grocery store that my parents received. I learned that professionalism is a moral responsibility and a code of conduct designed to put the patient first. As a third-year medical student now, I’ve seen just how high the stakes for professionalism really are, as it provides the foundation for every conversation, injection and procedure in our exam rooms and O.R.s. As I’ve traveled away from home—earning a master’s degree in global health from the London School of Economics and writing freelance articles on culture, politics and health—I’ve pursued interests complementary to medicine that I hope to incorporate into my future career as a physician-communicator with an interest in American health policy. Yet I frequently came back to the notion of professionalism I first encountered back in Durant. And lately, as a medical student, I’ve grappled with ideas about how it should evolve alongside the growth of social media and a hyper-partisan political climate, among other cultural forces. Back in my first year of medical school, I wrote an essay for STAT News on the questions of professionalism raised by Dr. Oz’s televised medical interview of then-candidate Donald Trump. More recently, I dissected the blurry ethics of medical students engaging in paid advertising for brands as Instagram influencers in a piece for Slate. Both of these essays elicited responses from more senior physicians who were and are eager to start a conversation about how these cultural moments could impact medicine in the near future. Although humbled by their reaction to these essays, I felt that what I was offering wasn’t necessarily novel from my perspective as a medical student. In many ways, I was only distilling the many conversations I had had with my peers about cultural moments and trends that are actively reshaping the guardrails of professionalism for our future medical careers. I just happened to be fortunate enough to have been given a platform from which I can share the depth of those conversations for everyone else to see. Too often, an older guard of physicians dismiss medical students as naïve and inexperienced, or even apathetic about our future careers—binge-watching Netflix and compulsively posting on Instagram if not studying for board exams, as a recent editorial for Academic Medicine chided. The mechanics of medicine itself are also highly hierarchical, tracing its roots back to military social structures (which is understandable, given the life-or-death stakes of our craft), leaving medical students at the bottom. For better or worse, these older beliefs and current structures frequently work to keep medical students, fearing some sort of reprimand, from questioning their surroundings and participating in conversations about professionalism or the direction of medicine itself.